Kathleen Wilson (b. 1943) was raised in Bloomfield, a predominantly white neighborhood in Pittsburgh, and earned both a B.A. in psychology and M.A. in special education from the University of Pittsburgh (PITT). She participated in her first demonstration at age 13, protesting segregated lunch counters at Woolworth’s in downtown Pittsburgh. She was employed at the Pennsylvania Human Relations Commission for over 30 years, investigating charges of discrimination brought by individuals in western Pennsylvania. Ms. Wilson became involved in the nascent Women’s Political Caucus and helped found the Pennsylvania Women’s Political Caucus in 1972. While volunteering in the local campaign supporting Shirley Chisholm’s presidential candidacy in the 1972 Democratic primary election, Ms. Wilson met members of the National Organization for Women (NOW). She was recruited to join NOW and was soon nominated for Vice President on a slate of officers. Ms. Wilson’s slate won the election but, within a month, the president-elect’s employer assigned her to work abroad. 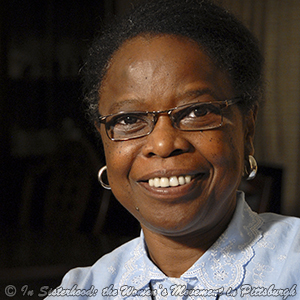 Ms. Wilson became the first Black woman to serve as president of the Greater Pittsburgh Area chapter of NOW when she assumed office in January 1973. Ms. Wilson has been an active member of NOW for 40 years. As president of the Greater Pittsburgh Area chapter, she helped start the Pennsylvania NOW chapter and encouraged Black women to join NOW in the fight for women’s rights. She encouraged the formation of a NOW chapter for Black women in Pittsburgh in 1974 and co-organized a Black Feminist Conference in 1976 that was attended by women from seven states. The conference was a platform for recruiting Black women to NOW in order for them to benefit from the gains of the women’s movement. Ms. Wilson has been active in the East End NOW chapter since it was formed in 1977. The organizational structure required co-presidents – one Black and one white – which allowed members to challenge racism within NOW. Ms. Wilson has served as co-president of East End NOW, Vice-President of Pennsylvania NOW and as a member of the national NOW board.